You’re on vacation. You’re soaking up some sun and fun at Typhoon Lagoon. Suddenly, it strikes! That insatiable hunger for something sweet and cold! This isn’t the typical craving that a puny Mickey Premium Ice Cream Bar can handle, you need a Jaws-sized sundae in order to take care of this stomach grumble. Luckily for you, Typhoon Lagoon has the hook-up you are hunting for. Swim on over to either Happy Landings or the Snack Shack and order up the Sand Pail Sundae. Served in a child’s sand pail, complete with attached shovel to get the ice cream into your gullet even faster, this sundae is the Typhoon Lagoon version of the Kitchen Sink. The pail is filled with chocolate and vanilla soft-serve, with layers of waffle cone and cookie pieces, hot fudge, and caramel sauce, and then is topped with a mountain of whipped cream, several handfuls of sprinkles, and a few cherries. I could be wrong, but I believe it constitutes an island unto itself. 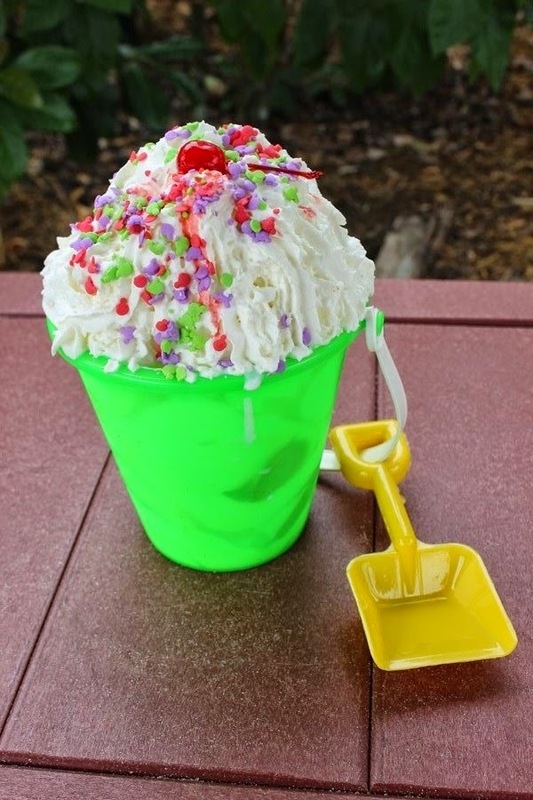 Obviously, the Sand Pail Sundae should be consumed by more than one person, but don’t let that deter you from trying to polish one of these off all by yourself! The soft serve will start to melt quickly, so make sure to grab a straw. As the chocolate and vanilla mix in with the hot fudge and caramel sauce you end up with a doozy of a milkshake. It will make the eyes of any child light up the minute they see it. Come to think of it, it’ll also put that dangerous, child-like gleam in the eyes of any grown men who even glance in the direction of the Sand Pail. No matter who consumes this mammoth ice-cream island, be sure that you stay clear of the Shark Reef for a few hours. You should be the only one enjoying a sweet treat that day!